As little as a few years ago, it was impossible to find “new” varieties of Haribo in the states, for the most part. There was a standard grouping of bags (Gold Bears, Fruit Salad, Alphabet, Raspberries, etc) that were available in many places, but beyond that set…you were on your own. I’m not sure exactly why or how that started to expand, but now in 2017, our Haribo options are definitely wider. Sometimes we see a new bag for a few weeks or months, then it’s gone. And sometimes, a new flavor gets added to the permanent rotation. Thankfully, this one falls in the latter category. Twin Snakes: half sour, half sweet. New idea? Not even close. 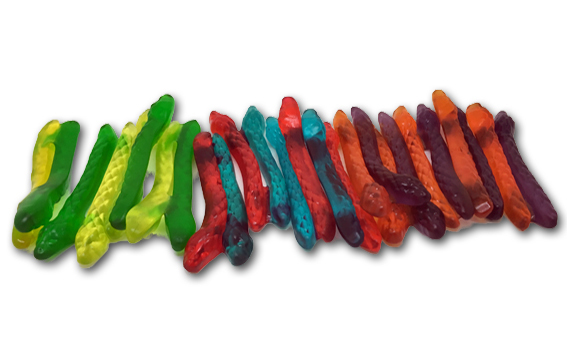 Hell, gummy snakes are so common that this is the second batch we’ve reviewed in a week. But these, friends, are different. Different in some technical ways, and in some magical ways. First, to the snakes. Three flavor combinations to be had: Cherry/orange, apple/lemon, and blueberry/blackcurrant. None of those combinations are typical, in fact I’ve never tasted any of them together before. That’s one of the things that really makes these interesting and tasty. 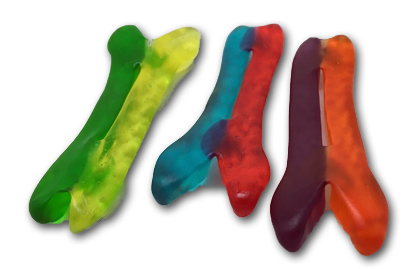 The other thing is the fact that the sour flavor isn’t a powdered coating as is so typical in gummies. Nope, this is just baked in, true sour flavor that doesn’t ease up from the coating in: this one’s fo life! These are wonderful. Haribo is usually quite good, but let’s face it, a lot of times, there’s a same-y taste thing going on. It’s a great taste, but a cherry gummy shaped like a bear or a rat or a pacifier or a …cherry, made by Haribo all taste the same. These are different-strikingly so-and that awards them our “Editor’s Choice”, which aint easy! As I said earlier, you can find these around if you look. World Market, even Dollar Tree has them now. But even easier is Amazon Prime baby, yeah! So just click that link below, and you’ll see why I’m gushing so hard about these. I didn’t realize Tom Edison hated snakes so much. Probably because they got in his first batch of light bulbs. Sounds like he’d like these ones though. 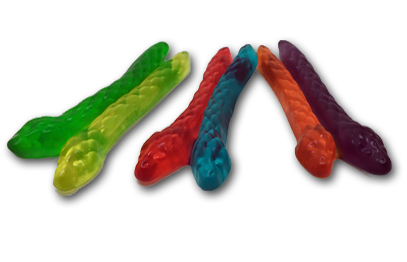 Actually, I tried these a few months ago when I was in the US, and they’re pretty much the same as the German “Bärchen-Pärchen” from Haribo which you also reviewed. 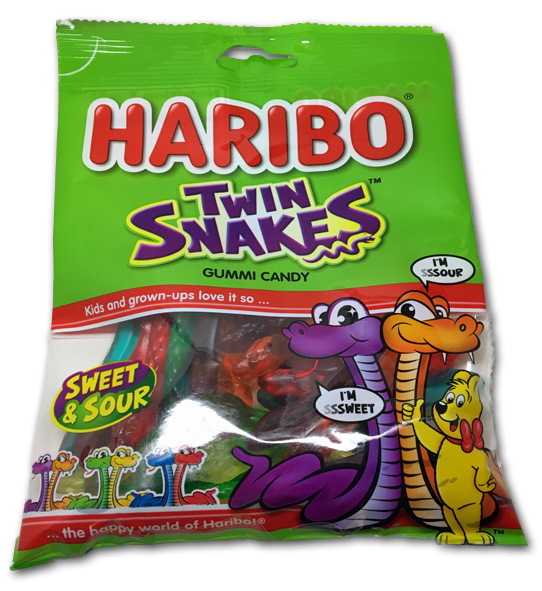 Only they’re Twin-Snakes instead of Twin-Bears, and the pairings have changed (with the Twin Bears, it’s Lemon/Cherry, Orange/Apple and Blueberry/Blackcurrant).